Weather As a popular gay vacation spot and international destination, Puerto Vallarta Mexico has plenty of gay excursions and activities for you to choose from. 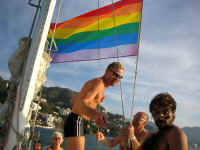 The gay-owned and gay-operated cruises and gay vacation tours in Puerto Vallarta are generally scheduled weekly during the "high season" winter months from November through March or April, with Diana's gay cruise-boat tour running once a week all year round. There are also a number of lovely getaways that might be fun to visit for day trips and which are listed below the gay tours section. 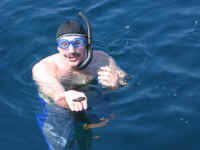 Note: You may also want to check out the Puerto Vallarta Activities II page for other daylife, vacation activities and things to do such as biking, bird watching, boat tours, ecological tours, scuba diving, sightseeing, whale watching, golf and tennis that are not gay or lesbian owned or operated but may nonetheless be enjoyable and of interest to you. On a 48 ft. katamaran for a good time on Banderas Bay with swimming and sunbathing. Diana's Tours cruise includes a full day at sea, continental breakfast, open national bar with unlimited beer, snacks, swimming and snorkeling, and a sit-down lunch on shore with a beer or beverage. During the winter months you'll likely also catch sight of some whales, manta rays and dolphins! Diana DeCoste is noted for her good service. 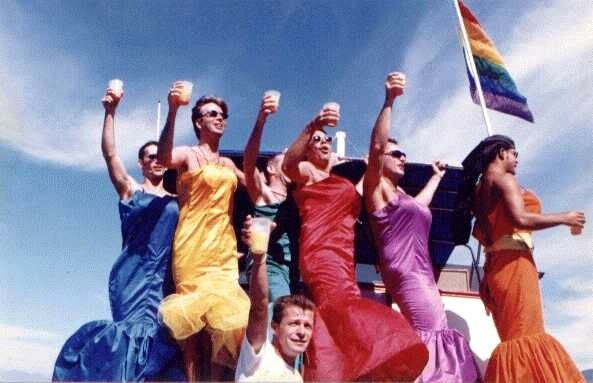 This Puerto Vallarta gay & lesbian cruise is quite popular and often sold out in the autumn and winter, so advance reservations are recommended and tickets are available on-line or at the Blue Chairs Resort and at Hotel Mercurio. Please be at the Los Muertos Pier not later than 9am; departure at 9:30am. There's also a fun post-cruise party on the rooftop at the Blue Chairs gay hotel. 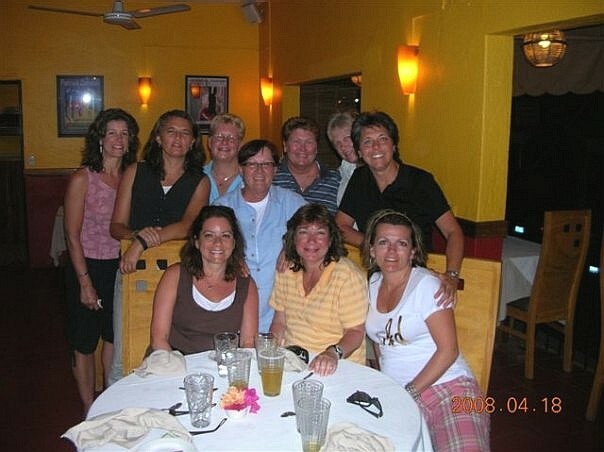 This well-established excursion in its 18th year is the longest running of any Puerto Vallarta gay tour, and goes out every Thursday of the year. (Note: Diana sometimes take time off during the summer Jun-Sept so please check her website for complete info). Listed as one of the top Vallarta attractions or things to do at TripAdvisor. Cost in 2017-2018 at $110 USD or Mexican peso equivalent, plus tipping. Contact Diana DeCoste at Diana Tours - at Puerto Vallarta or local Tel: 222-1510. See my new webpage for more photos and info. Oscar Frey is an Oceanologist and whale photographer. He started his Puerto Vallarta whale watching tours in Banderas Bay in 1994, while also running a research program involving humpback whale distribution, numbers and behavior in this part of the Mexican Pacific. Oscar is also a consultant to the Department of Oceanography and Eco-Tourism. The Responsible Whale Watching Tours with Ocean Friendly includes: illustrated field guides; a meal service of homemade pannini sandwiches, condiments, snacks, fruit, bottled purified water and soft drinks; restroom facilities on the 30-foot boat; and a hydrophone system of underwater microphones to listen in on the whale songs and dolphins while on the boat. Advance reservation required. Oscar is gay but the tours are open to all, for 4-8 persons. I have received and read excellent reports of the Ocean Friendly tours, which is one of the most highly regarded and rated of any Puerto Vallarta tours-excursions. Well recommended. Note: Whale tours from approx Dec 8-Mar 23 only. $129 USD per adult person. See photos from some terrific Puerto Vallarta humpback whale tours. Meet at and return to Los Peines Pier, Marina Vallarta. Cellular phone: 044-322-294-0385; Tel: 225-3774. Ecology Note: We ask our friends and clients to boycott the jet skis which pollute the air and water, endanger wildlife and diminish natural quiet. Reports show that at least 25% of their fuel goes directly into the water and we'd like to help with the current efforts to clean up Puerto Vallarta waters and Banderas Bay. Thanks. If you want to get away, there are cruises and tours that will take you out of the city, some of which are listed above on this gay Activities page, or over at the straight-owned and operated Puerto Vallarta tours page. Here below are a few of the lovely places you can visit to further enjoy your stay on the Pacific coast. Go here for further information and photos of Banderas Bay beaches. 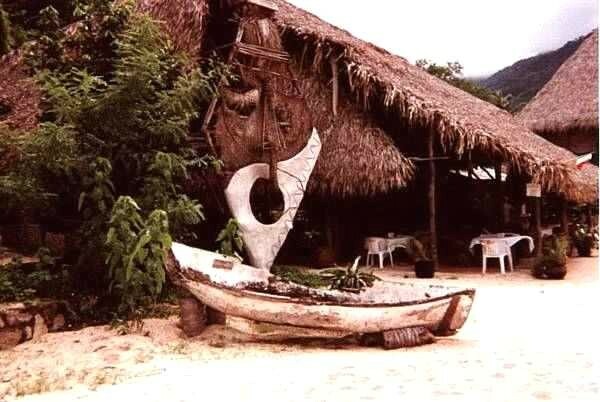 It was here in the village of Mismaloya, approximately 10 miles south of Puerto Vallarta, that the movie "The Night of the Iguana" was filmed by John Huston in 1963. A part of the original set is still in existence, and if one knows the movie, walking onto the set can be an experience. Nearby is a restaurant named in its honor, with food, drink and views of the bay. The small beach at Mismaloya has several restaurants and there are boats for rent for a trip to the rock formations at Los Arcos. The movie Predator was also filmed in Mismaloya in the 1980s. Horses are available for jungle rides, and a trip up the Mismaloya River to the restaurant Chino's Paradise is popular. A small village on the south bay past Mismaloya, accessible only by boat. Many of the day cruises drop anchor here for several hours so that their passengers can horseback ride up to the popular waterfall in the mountains. Several palapa roofed restaurants line the cove in Quimixto. If you want a quiet and still undeveloped area for relaxing and taking in some of the natural beauty of the Bay, try this getaway for an afternoon. 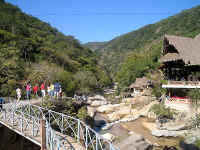 You can get to any of the south bay villages by water taxi from the small village of Boca de Tomatlan. Or hire your own boat in Boca or in the nearby village of Mismaloya, and then you can take a spin to some secluded beach or village! 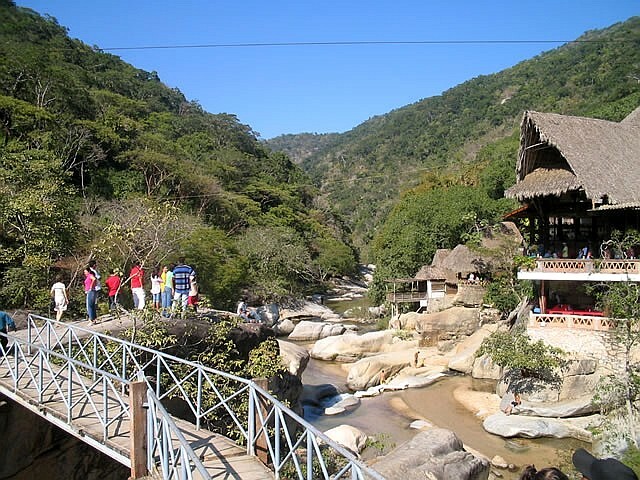 Majahuitas (photo left) is a secluded, picturesque cove surrounded by verdant hills between Quimixto and Yelapa. A quaint beach resort hotel and restaurant can provide accommodations and food. The small beach is one of the loveliest in the south bay and the area is excellent for swimming and snorkeling. 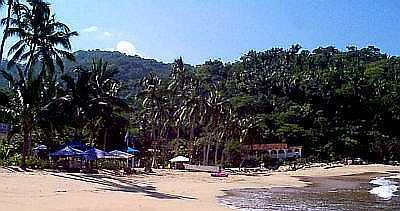 The Puerto Vallarta getaway of Majahuitas is famous among scuba divers for its underwater canyon just outside the cove. Yelapa is the most remote fishing village on the South Shore of the bay, also accessible only by boat. It is popular because of its beauty and the slow pace of life, and is known as something of an artist retreat and hippie hangout. Several day cruises stop there for a few hours and like Quimixto there is a river and popular waterfall. Yelapa is very laid back and has real charm, with palapas and seafood restaurants on the beach and small bungalows and houses that dot the jungle hillsides. There are few telephones and no cars, gracias a Dios. Electricity has recently made its way to the village, which used to go dark around 10pm after everyone turned off their generators. One of the restaurants becomes something of a night spot/disco in the evening. Lodging is still reasonably priced. There are water taxis from Puerto Vallarta and the village of Mismaloya which go to Yelapa that run in the morning and afternoon. Here's the general schedule, but you should double check these times before making your final plans: Leaving Los Muertos pier to Yelapa: 10am, 11am, 11:30am, 12:30pm, 4pm and 5:30pm; leaving Yelapa to Vallarta's Los Muertos pier: 7:30am, 8:30am, 9am, 10:30am, 3pm, 3:30pm and 4:30pm. Twenty miles or so beyond Bucerias, but on the Pacific coast, is a favorite gringo getaway, the small picturesque village of Sayulita with its two thousand inhabitants. Surfers like it because the cove there gives good waves pretty much the whole year (the best waves are Nov-Apr), and it is the favorite surf spot in the Banderas Bay area. 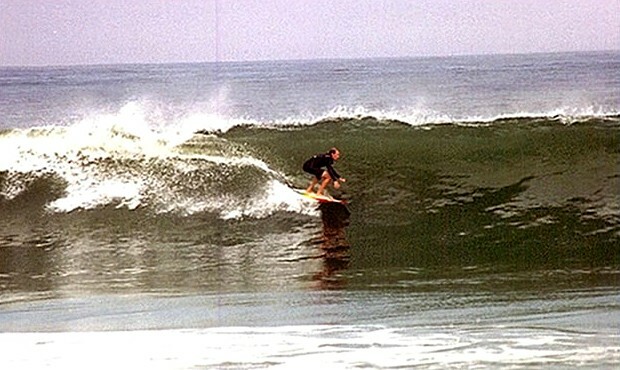 Several of Mexico's finest (and handsomest) surfers live and surf here - long board and short board are both popular. There are pleasant beach-front restaurants, including the upscale Don Pedro's and the popular Capitan Pablo's, as well as bungalows, villas, guest houses and camp grounds.